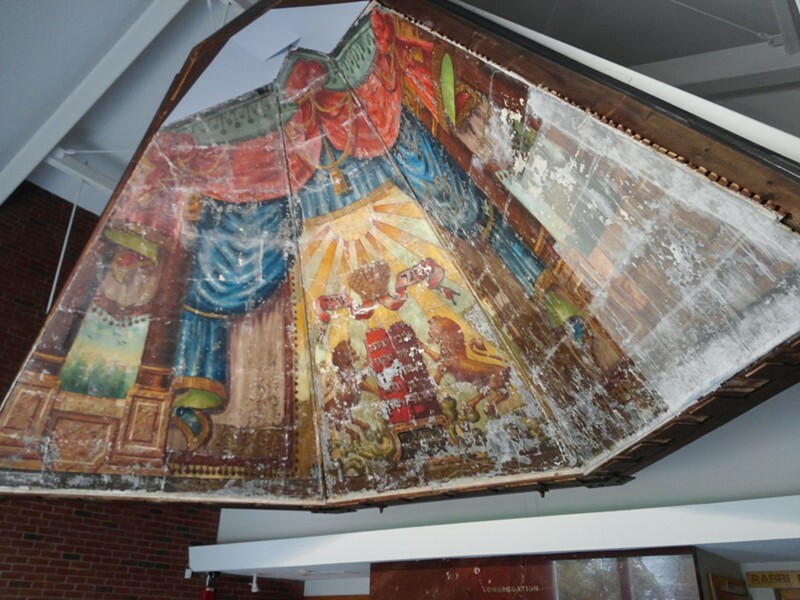 The mural that was recently unveiled to the public at Burlington’s Ohavi Zedek Synagogue has been celebrated, forgotten, rediscovered, restored and transported, but, despite its 100-plus years, has not lost its ability to impress. 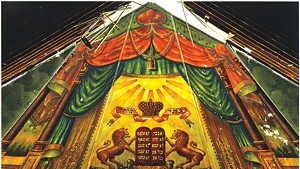 Hanging in the synagogue’s foyer from a specially constructed steel frame, the mural commands attention even though it hangs at second-story level. Its blues and yellows are rich not just in hue but in symbolism, and its three-paneled, triangular form is so unusual as to inspire curiosity. It’s a one-of-a-kind work of art, and those who have been working for years on restoring it are keen to give the mural its due. In a ceremony at the synagogue on Sunday, dignitaries, religious figures and project supervisors gave the public its first look at the mural’s new, permanent home. Among those who spoke at the ceremony were former Vermont governor Madeleine May Kunin, Burlington Mayor Miro Weinberger and U.S. Sen. Patrick Leahy (D-VT), who had mentioned the so-called Lost Shul Mural in the Congressional Record of July 7. The artwork has a fascinating history. It was painted in 1910 by a Lithuanian immigrant named Ben Zion Black, who adorned it with images and symbols that suited its purpose as an altarpiece in a temple in the city’s Old North End. On full view for worshipers for nearly 30 years, the mural was abandoned when the building was sold and repurposed as retail space. 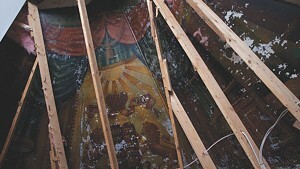 Unmaintained and largely forgotten, the mural nevertheless remained incongruously on display in the carpet store that soon occupied the property. There it languished until 1986, when Ohavi Zedek archivist Aaron Goldberg rediscovered it. Goldberg assembled a restoration team whose first major task was the construction of a wall to protect the mural from further disintegration until such time as it could be preserved and relocated. 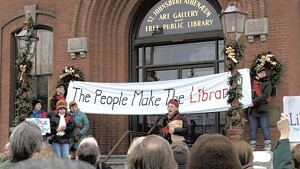 That time didn’t come until nearly 30 years later, when sufficient funds had been raised to build a temporary structure around the mural to allow for its restoration, the first stages of the restoration itself, the design and construction of a custom steel frame, and the careful transportation of the intact mural to its new home some six blocks away. The shape and dimensions of Ohavi Zedek’s lobby are such that the mural seems to nestle naturally into the space, a fact that has not escaped Goldberg’s attention. “It does kind of look like this room was built for it,” he says. Even after all the hard work, the Lost Shul Mural project is not yet complete. When Seven Days visited the synagogue, Goldberg was holding a meeting with several committee members to discuss the project’s next stages. Initial plans include a second wave of fundraising, the funds from which will be earmarked to pay for the mural’s final restorations and for educational and outreach programs. Project supervisors estimate the remaining expenses at about a half million dollars; some $430,000 was required to get the mural to its current condition and location. The first step: “The discolored varnish and dirt need to be removed,” Kerschner says, gesturing to portions of the mural on which such processes have already been tested. After that, any losses in the paint will be filled in. Finally, atop those fillings, conservators will "in-paint" only the portions of the pigments that have been lost, taking care to match Black's original colors. Any such alterations will be made with paints that are "reversible": removable without damaging the original paint. Kerschner estimates that the whole process will take at least six months. At present, portions of the mural are covered in a barely visible protective silk mesh, which prevented paint from flaking off during the transportation of the mural. A second, stronger layer of mesh, made of fiberglass, prevented the plaster on which the mural is painted from pulling apart from the wooden lath that supports it. Further protection of the paint was provided by a waxy substance called cyclododecane, which possesses the property of sublimation, meaning that it “melts” from a solid state directly to a gaseous state, bypassing the liquid phase entirely. Whitish splashes of the compound remain on the mural, but will, according to Kerschner, disappear within three or four months. Also on the committee is Samuel Gruber, an art and architecture historian who is president of the International Survey of Jewish Monuments and of the private restoration firm Gruber Heritage Global. Though based in Syracuse, N.Y., Gruber has been consulting on the Lost Shul Mural project for the last two years, and has a rich understanding of the work’s artistic and historical value. “It’s a survivor,” Gruber says. “It survives. 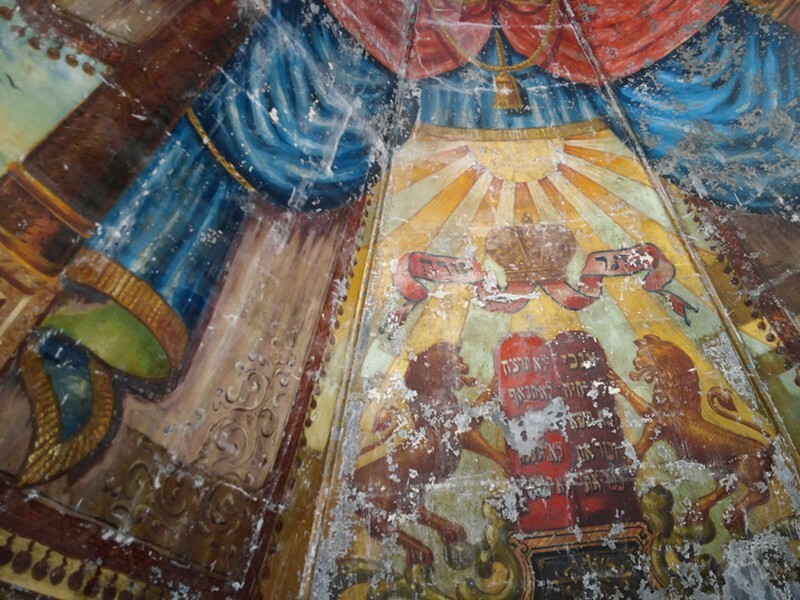 We know that there are richly painted, richly colored synagogue interiors [in Eastern Europe], but most of them have been destroyed. 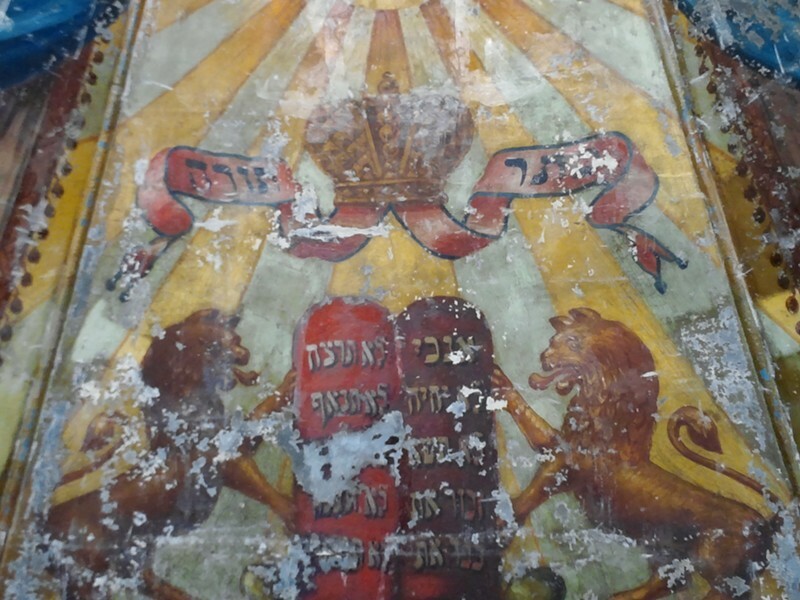 In this country, immigrant synagogues were often very richly painted, and a few of them survive. But even when the full decoration survives, none of them are quite as big and as grand as this.” He says he has been “bowled over” by the sheer presence of the mural. Mural artist Black, as Gruber points out, was a fine painter, but will never be considered a great master. His work “is not incredibly subtle, but it’s very vivid. He has a pretty lively brush,” Gruber says. But Black was no hack, either. His background in illustrating books and painting theatrical backdrops served him well. The painting has a pleasing lateral symmetry, and his Lions of Judah rear up with iconic power. Gruber singles out an unexpectedly impressionistic touch: the hazy depiction of an ethereal landscape that Black placed in one of the windows he painted into the artwork. But the mural itself offers the clearest window — onto Vermont’s intertwined but relatively little-known histories of religion, immigration and art. This article was updated on August 4, 2015, to clarify details about the processes involved in the conservation of the mural.